Like to dabble with psychedelic concoctions? Ever been so desperate that you'd eat morning-glory seeds on a salami and mustard sandwich, just trying to get high? Whether you're an occasional user or a full-fledged abuser, this compliation of far-out stories will keep you guffawing for hours. Paul Krassner, "father of the underground press," has gathered tales that explore the wacky, weird, and outrageous experienecs of folks experimenting with magic mushrooms, ecstasy, peyote, opium, DMT, cocaine, belladonna, toad slime, and a whole host of other mind-blowing, eye-popping, consciousness-expanding substances. 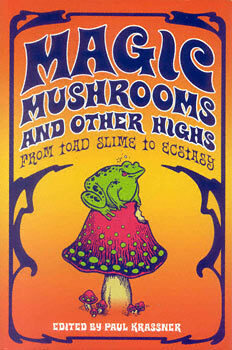 Stories by and about Terence McKenna, John Lennon, Ken Kesey, Ram Dass, William S. Burroughs, Michael Simmons, R.U. Sirius, John Lilly, Robert Anton Wilson, Ivan Stang, Stephen Gaskin, and Lisa Law will leave you laughing, groaning, and possibly gunning for a little something special from your own stash. Paul Krassner, world-famous writer, rabble-rouser, and cofounder of the Yippies, was a publisher of The Realist from 1958-2001. He even accompanied Groucho Marx on his first acid trip. At the 14th annual Cannabis Cup in Amsterdam, Paul was inducted into the Counterculture Hall of Fame--"my ambition," he claims, "since I was three years old." He lives in Southern California.